They're not known to do things by halves across the Atlantic and New Year's Eve is no exception – think spectacular torchlight descents, massive firework displays and early festivities just for children. Each ski town has its own vibe: clink glasses with celebs in Aspen, huddle around a fire pit in Breck or get your Wild West on in Jackson Hole. Whatever y'all do on the 31'st, you're easily getting more bang for your buck over here, with the rest of your stay spent skiing what just might be the best snow on the planet. Chalet Victoria fits right into Breck's Victorian architecture and all the action on Main Street is only a few blocks away - for watching the fireworks, grab a cocktail at Burke and Riley's which claims to have the best views in town. At the pretty Chalet Huckleberry in Vail you're right next to the ski bus stop, for quick and easy access to the second biggest ski area in the USA. Chalet catering gives you all the comforts of breakfast, afternoon tea and dinner in your own home with none of the housework. Book out the whole place with friends and family, especially if you've got a hot tub, the holy grail of ski holidays right on your terrace. Sitting outside with the snow, stars and a bottle of bubbly is a dream on NYE – even more so if you manage to catch the fireworks overhead. For something slightly different, the Cowboy Village Log Cabins in Jackson Hole are another type of self-contained accommodation. They usually come with a B&B package, meaning you get your own space and the opportunity to dine out in Jackson's awesome restaurants for lunch and dinner. With so many hotels to choose from, you can pick one to suit your New Year's agenda. Our top hotels have special touches such as award-winning restaurants, ski valets, and spas. Pick 5 star luxury if you plan to end the year in style or go for ski/out if it's all about the slope-time. You'll find most hotels host their own festivities on the big night. We can't go without mentioning Aspen's Sky Hotel, where the New Year Sky Ball (complete with champagne and caviar) is the most exclusive party in town. The hotel's also right next to the Silver Queen Gondola, if you're more piste than party. Also in Aspen, the Molly Gibson Lodge and Hotel is close to Wagner Park, usually the stage of a bonfire, DJ and early firework display for children before the big ball drop at midnight. The Lodge at Vail is one of Vail's oldest hotels. Right in the centre of the pedestrianized village, it's a snowball's throw from the Dobson Ice Arena which is rumoured to turn into Vail's largest nightclub for a countdown to remember. Celebrate New Year Cowboy-style in Jackson Hole, where the Ranch Inn is round the corner from the legendary Mangy Moose saloon. Ultimately you've come to the USA for the skiing – check out Breck's Double Tree by Hilton or Steamboat's Ptarmigan Inn for slope-side accommodation which'll get you right out onto that legendary American powder. Get some quality time with friends and family over New Year in one of our ski apartments. Mostly in the form of lodges and condos, the self-catering accommodation across the pond is generally roomier than your typical apartment in the Alps. It tends to be a bit easier to fend for yourself too - the big American ski towns have huge choice when it comes to food shopping and restaurants (with the likes of Breck's Empire Burger and Bubba Gump Shrimp Co., it's a challenge not to dine out all week). As the name hints, Winter Park's Zephyr Mountain Lodge is right at the bottom of the Zephyr Express, taking you to just one of the resort's 7 linked ski areas. You'll also be prime position to get to The Lodge At Sunspot if you've secured a table for their super popular New Year's Eve feast. At the new Fraser Crossing Condos, you're a short walk from the quick and quality Pizza Pedal'r if you find yourself craving some restorative grub after a day on Colorado's famous powder. In Breckenridge, you'll find the ‘Four O'Clock' green trail running right past the Pine Ridge Condos. 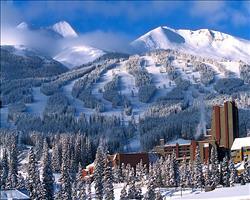 With a lift in easy walking distance, you'll have first pick of Breck's 187 runs. Alternatively, wake up on January 1st to the peace and quiet of East Vail Condos, set apart from the town centre with views of Gore Creek.